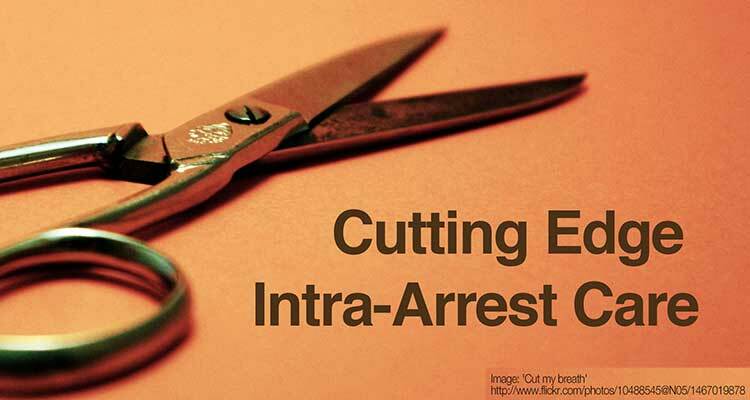 Here's my first lecture from SMACCgold: The New Intra-Arrest. It generated a bit of controversy amongst my critical care friends, so we'll be discussing various parts in more detail in the coming weeks. Adrenergic agents with predominant a2 effect have been shown to be more effective as vasoconstrictor drugs, presumably because extrajunctional a2-receptors are more accessible to circulating catecholamines than postjunctional a1-receptors. This may explain why adrenergic amines that have predominant a1 actions such as methoxamine (Vasoxyl) and phenylephrine (Neo-Synephrine) are less effective than epinephrine after prolonged cardiac arrest. Note: To do hemodynamic dosing of vasopressors properly, it is imperative you read this post (choosing the correct DBP); you should also probably listen to that podcast. Cardiac Arrest: To the cath lab with ongoing chest compressions? Beta-blockade should be considered in all patients with RVF in the ED prior to cessation of resuscitative efforts. Gerstein N, McLean A, Stecker E, Schulman P. External Defibrillator Damage Associated With Attempted Synchronized Dual-Dose Cardioversion. Ann Emerg Med. 2018;71(1):109-112. https://www.ncbi.nlm.nih.gov/pubmed/28559035. Scott Weingart. Podcast 125 – The New Intra-Arrest (Cardiac Arrest Management). EMCrit Blog. Published on June 2, 2014. Accessed on April 23rd 2019. Available at [https://emcrit.org/emcrit/new-intra-arrest/ ]. Curious as to how are you able to get the other staff (nursing, respiratory, er tech etc.) not only understand “Truly Advanced Cardiac Life Support for Resuscitationist” but be on board after years of AHA “cook book” courses? Everyone knows how to set up (all the equipment) Lucus device and all respiratory is on board to use the ventilator during arrest etc? If you are not there to supervise is it still performed to your standards? We have a great podcast on this at edecmo.org. Joe and Zack discuss how they work the logistics and got folks on board. Maybe there is also space for further improvements when using TEE. Would like to know more on using a custom bent Levitan/Shikani/Bonfils optical stylet down a LMA. Is it easier than a bronchscope/flexible scope down a LMA? Which LMA? Do you use it outside of CPR? Wee? Long time listner. This podcast really blew my mind. It made me rethink my whole approach to running a code and what is really possible. The dosing of epi along with the femoral aline is a great idea. Credit to you Scott. You are a pioneer blazing pathways in the most admirable fashion possible. Your talk on the New Intra-Arrest was totally “inspirational”. Keep up the GREAT work! What is your dose of steroids and vasopressin? How many times do you give each? Do you give the 300mg dose of hydrocortisone after ROSC? straight-up study dosing. I defer the hydrocortisone decision to my ICU colleagues, though I think it is prob. a good idea. ECPR patients? Solumedrol 40mg x1 with first or second epi then stress dose hydrocortisone 300mg x 7 day taper. That’s what I do. Great talk. I really like the idea of adrenaline titrated to diastolic BP, makes alot of sense. Just curious if you’re thinking about using long a-lines to get into the aortic arch as suggested in the SAAP podcast? Or do you think actually at the moment it’s best to bypass that and go straight to ECMO? While in med school not very long ago i heard a talk from Prof. Douglas Chamberlain for was one of the guys who really pushed forward ALS in europe. He wasn’t a fan of adrenaline any more but he also passionate that we as doctors and other professions working around resus should be doing much more sophisticate resus that what’s currently required. 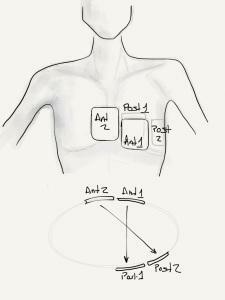 …and the A-line can be up-graded to the arterial ECMO cannula if ROSC not achieved and your patient is not palliative! I agree with the other listeners that this truly is a cutting edge approach to resuscitation. However, I think it seems to be best suited for an ED resus room or perhaps even ICU / OR. Have you published or plan on publishing data that show improved neurologically intact survival when you use this bundle? How would you modify your approach to be cutting edge intra-arrest care for the “floor code” inpatient where we don’t have quantitative ETCO2, Mechanical Ventilators, A-Line Transducers/Monitors, LUCAS devices, ECMO cannula etc. readily available? Do you have a resus officer that comes along to arrests? One of the hospitals i worked in had one who’d bring a monitor that had etc02. If the patient was an ITU canditate the tech would bring up an oxylog too. Hospital i’m at now has a pocket etc02 monitor for the gasman (or woman) who’s on the crash team that day. LUCAS comes in a bag too so you could potentially bring that to every arrest if there was the motivation. Reference for steroids? As usual great talk that will improve the care i deliver! I love emcrit. Terrific talk as usual. I think your citation above for etCO2 during arrest is slightly off, it looks like you meant Anaesthesia 2011;66:1183. – Isn’t there more evidence showing harm from mechanical CPR devices than benefit? – Is there any evidence to support advanced airways in the cardiac arrest patient? I understand that there is research showing harm with the use of “cuffed” supraglottic devices, but we use the I-gel, which I have not seen any evidence against; furthermore, it appears it would be more beneficial to utilize upstroke ventilation with or without a ET tube in place. – Are you publishing any of the data that you have collected utilizing your approach? 4. Bundle publications are fraught with problems, I’d rather see each component proven. People smarter than me are working on exactly that. Does the current research recommend one particular mechanical compression device over the other (circumferential band vs. piston driven)? In regards to the second question. You made mention to supraglottic devices and how we can not achieve the pressures necessary to ventilate the patient on the downstroke of chest compressions. I was just asking if ventilation on the upstroke is preferred. Scott, is there any literature specifically on the crappy sealing pressure during downstroke? I have been searching but couldn’t find anything except for the swine study demonstrating low carotid blood flow. Thanks! Don’t believe your own dis-hype, it was a great lecture! Way to integrate all the cutting edge stuff, and not “just” one, and make people see, more importantly, the physiology of it, and the importance of tailoring to each patient. I’ve always said that people confuse the concept of guidelines with that of optimal care. Guidelines are just that, lines by which to guide you, not railroad tracks. They are needed to some degree, however, as there are some who do resuscitation but are not resuscitationists, if you catch my drift, and then those guidelines are better than what they might come up with…but many of us can certainly do better. …and sorry for being so slow to join the CME – kept meaning to and forgetting, but now it’s done, and everyone should do so!!! Question about the epi – do use still use IV push as required by DBP or do you use a continuous drip and adjust the dose? Great talk which inspired me to read the JAMA VSE article. The JAMA article refers to cardiac arrest in general. If you have a patient in PEA, give epinephrine and vasopressin, then go into VF, so you shock and give epi – are you still continuing the vasopressin during that second round of CPR? Seems like this trial overall had good results. I wish it would be followed in more hospitals in order to hopefully better help our critically ill patients. QUESTION: If a skilled EMS unit arrives at the scene of cardiac arrest – HOW LONG should they work in the field at trying to attain ROSC before initiating transport of the patient to the nearest ED facility? How much does the answer depend on: i) If there is a mechanical CPR device that can provide continuous high-quality CPR en route during a bumpy ambulance ride? and ii) Availability of an ED in close proximity capable of offering services not possible in the field (ie, bedside Echo; ECMO; cath and PCI)?